Henry M. Butzel was born on May 24, 1871, in Detroit, Michigan, and attended public schools there. Butzel then attended the University of Michigan and received a Bachelor of Philosophy, and later, a law degree. While in Ann Arbor, he was one of the founders of the University of Michigan Daily. In addition to his work on the Court, Butzel was involved in many other public and private organizations. He founded the Legal Aid Bureau and was chairman of the Legal Aid Section of the Draft Board. 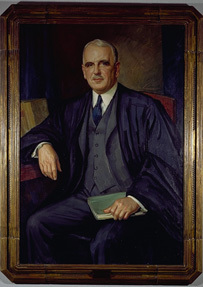 From 1927 – 1929, he was the President of the Detroit Bar Association. Butzel served as the chairman of the Judicial Council of Michigan and was also active in the movement to improve Court procedure. Butzel, along with his brother, Fred Butzel, engaged in many philanthropic endeavors. His retirement from the bench at the age of 84 did not end his public activities for he returned to an important position in Detroit community affairs and to the active practice of law with the firm he founded. He was married to Mae Schlesinger in 1907 and had three children.